Hi friends, here is the free Account unlock solution for Micromax MediaTek Canvas 2 Q4310. Download free frp or Google account unlock file and flash tool, then follow the procedure here to unlock the phone, which is absolutely free, just download the Smartphone flash tool and FRP file and Google Account unlock. 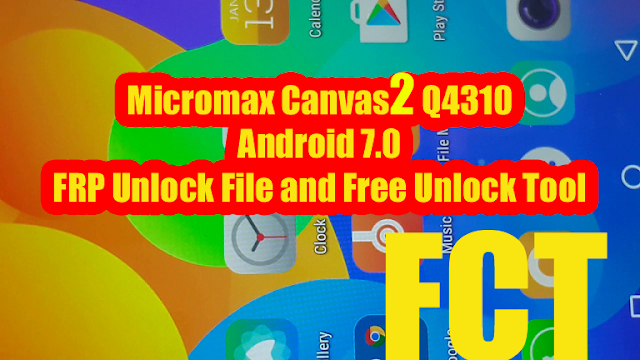 Micromax Canvas 3 Q4310 Android 7.0 FRP Unlock File and Free Unlock Tool. Q4310 How To FRP Reset - SP Flash Tool? Open SP flash tool and load the Android scatter file. Now go to format Tab and select Manual format flash. Now enter the begin address and format length. Click on Start and connect the switched off phone to PC. After format OK, remove the phone and switch on It.